When Adam Schiff announced that as head of his committee, he was going to lead in investigations into trump’s business and personal life, trump threw a twitter tantrum. That was to be expected from a man who seems to think that he is exempt from any over sight. Furthermore, actually seems to think that he is owed loyalty and/or agreement from those around him. Well, Congress is a co-equal body of government. It is their JOB to resist and even fight against any president’s abuse of power or wrong decisions. That is what they are for. Certainly not there to agree with everything or work FOR the person in the White House, no matter who it might be. Yet, in addition to trumps usual bull about investigations been bad for the country, we have Mulvaney saying that the democrats are betraying what they said they would do. He managed to say, with a straight face apparently, that the democrats promised to work FOR trump in his position. Well, I never heard of a single democrat saying they would work FOR trump. What I heard was that they would work WITH trump. So who does Congress work for, at least ideally? Their job is to work for the American people. That is especially true of the House. They are there to represent those that sent them to Washington to represent them. If any democrat had said they would work FOR trump, I would have called them out as a traitor to the people. trump liked to claim that there is no connection from him to Russian oligarchs, but that claim is counter to the evidence. First of all, trump worked with and for Russians in his dealings with Bayrock. In addition, Manefort and Cohen have been involved with exploration of further connections, including a tower in Moscow. It is simply not true that no avenues implying the willingness to collude have been found. Exactly the contrary in fact. Finally, in summary, it is not only valid, but imperative, that some investigation into trumps business dealings be done, and quickly. Those business dealings will likely tell us just how beholden trump really is to his Russian Oligarch friends. We already know that Eric observed in the early 2000’s that the Russians were where much of the businesses money was coming from. Since trump is the first president in modern history to 1. refuse to reveal his tax returns and 2. refuse to divest from his many business deals (utting his sons in charge is not a true divestment), then he needs to be investigated. The Democrats, Pelosi and Schiff both, have indicated from day one that they would pursue investigations AND be able the business of creating bills to make the life of the American people better. They are doing the latter already. It is time that they also do the former. Investigate and Legislate, the two wings of their duty. The fact that trump and some of the republicans are fighting that shows that the investigations are even more important. Guilty people usually scream the loudest, as my mother taught me as a child. Adam Schiff is doing his job.....You go Boy!!! The chickens are coming home to roost!!! Yes, indeed. Pelosi and Schiff are doing their job, both working for bills t help us citizens AND investigating to find out how corrupt trump just might be. of courwe he hates that, and his followers that believe everything he puts out there are offended that the rest of the country is not as brainwashed as they are. after all the money spent on the Benghazi investigations for nought, compared with all the indictments so far in the orange maggot's circle of friends and associates, you'd think the "idiot base" would wise up and see that they are being hoodwinked!! Yeah, and trump can still ignite his base by saying "crooked Hillary" and yet all this evidence just laying about showing trump guilty and they ignore it. what really stupefies me to absolute distraction is their idiotic assertions that it is the left who are making up stories. They believe their dear leader's lies and accuse the left of being the liars....it would be hilarious if it were not so mind-numbingly crazy!! I understand. It is like an entirely different mind set....with a totally opposite view on what is real. 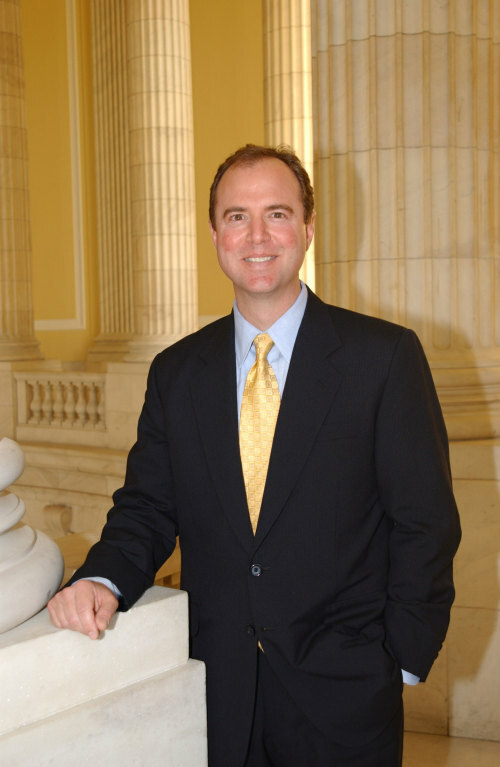 Bless you Adam Schiff, Thankful for standing up for the people.